Almost two-thirds of Italy's farmland has been hit by a prolonged drought, costing Italian agriculture some €2bn ($2.3bn; £1.8bn), farmers say. Dairy farmers and those growing olives, tomatoes and wine grapes are among the most affected, farmers association Coldiretti warns. Rome faces eight hours a day without running water after a halt was ordered on pumping water from a nearby lake. Coldiretti warns that 60% of farmland is threatened by the drought caused by low levels of rainfall and made worse by a heatwave. Wine grapes and olive production are suffering throughout much of Italy, amid concerns that a poor harvest could push prices up. 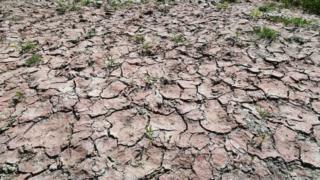 At least 10 Italian regions are preparing requests to the agriculture ministry for a state of natural calamity to be declared because of the drought, Italy's Ansa news agency quotes sources as saying. In Rome, utility company Acea has warned of drastic water rationing after the local authorities in the Lazio region ordered the halt to pumping water out of Lake Bracciano, about 30km (19 miles) north of the capital. The governor of Lazio told Tgcom24 TV station over the weekend that "the truth is Lake Bracciano has fallen too much and we risk an environmental disaster". He added that only 8% of Rome's water was coming from the lake, urging the city authorities to find a solution quickly. Earlier this month, Acea began shutting some of Rome's famed drinking fountains.